Libby Stratton is a widowed, single mom fighting an incurable cancer. Faced with the prospect of leaving her six-year-old son Danny to be raised by her in-laws, Libby places an ad looking for someone to turn her into a vampire. After waking into her new life as one of the undead, Libby starts to realize the ramifications of her actions. Luckily Jane Jameson and her undead circle of friends help Libby make the necessary adjustments, and then there is Wade, hunky human father of her son’s best friend, who is willing to help Libby in ways the Vampire Council can’t. I always enjoy my time with the denizens of Half-Moon Hollow. Ms. Harper’s southern small town is filled with crazy mischief, lots of humor, good friends, and the occasional mishap or five. The regular cast of characters is extremely likable, and I want to befriend each as I cheer for a happy ending. On the flip side, her antagonists are generally despicable yet complex, and I enjoy that sometimes they aren’t as they seem. 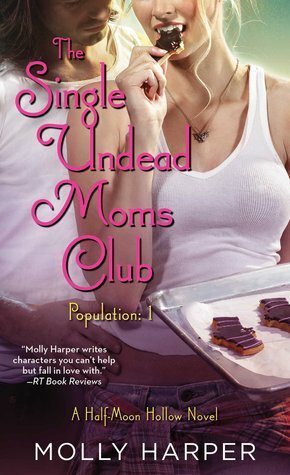 And while the Half-Moon Hollow series, as well as the original Jane Jameson series, feature the struggles of women who have been recently turned into vampires, The Single Undead Moms Club stands out because Libby must integrate herself back into the human world and raise her human son. I really enjoyed Libby and Wade as a potential couple. They shared an awkwardness and a “I don’t give a damn” attitude that bonded them right from the get go. Their initial spark smolders a bit until their passion ignites into flames. They just fit so well together, and they made me smile. I adored how much Wade cared for Libby and wanted to help her without smothering her. I also loved and appreciated Jane’s constant help, especially with the frame of reference that Jane didn’t have it when she had been turned. What I didn’t really care for was Libby’s unexplained attraction to her Sire, Finn. Having never met him, I didn’t understand Libby’s strong desire to make nice and almost please him. He came across quite creepy to me, and therefore her actions around him felt misplaced and odd. I felt similarly about his mysterious companion as well. Overall, I simply enjoyed The Single Undead Moms Club and found it to be an engrossing, quick read. Ms. Harper’s characters are likable and one-of-a-kind, with Libby, Danny, and Wade all adding seamlessly to the existing cast. I adored Libby and Wade and wished there had been more time to explore their connection. The story took some unexpected turns, adding to the enjoyment of the plot and keeping my interest level piqued throughout. I cannot wait for a return visit to Half-Moon Hollow! I’m excited to get to this book. I’m waiting for the audio. I’ve been reading the HMH series, but after listening to Jane’s series, I want to go back and try these in audio. Is it weird to have the same narrator across several books with different female leads? I don’t think so, but I listen to so many different PNR series with different couples each time. Most good narrators are good about keeping the voices for each character the same, even if they are no longer the lead and getting a new voice for the new character. When it’s third person POV, I do okay – like in the Kowalski series, but with this series, each book is a first person POV from a different person. Even when reading, I get confused at first… Is this Jane, Iris, Libby… lol! I didn’t move on after the Jane books, so I didn’t get to the Half Moon Hollow. I need to get back to them. I really enjoyed the audio. I actually started with HMH and only recently went back and listened to Jane. It’s a wonderful spin off series, and we still see Jane and friends – especially in this one. I think she wanted to please him because 1) he saved her “life” and 2) from all my past vamp books the turnee and turner have an odd bond like a baby chick with the first thing it sees. I understand the reasons listed; mine was more of a rhetorical “why?” I just never felt that those emotions were depicted at all, and therefore, didn’t fit the character. She has such a spark with Wade, you know? Gah she’s a good one. Glad to see this one was so good! I’m massively behind on them at this point. 2016 I’m gonna have to change that. Yes! If you can’t fit in reading the books… definitely go for the audio!